So it’s not necessarily a bad thing that we’ve been seeing some backlash against standing and treadmill desks. There’s no denying that standing and treadmill workstations have been enjoying a boom in American workplaces of late, and some people have begun to question whether or not they hold water as an office health hack. Case in point: ABC News recently released a two page article entitled “Stand Up for Better Health? Maybe Not”. The second we saw this one, we knew we had to respond. We appreciate the question they’re asking…but we’re not so sure we agree with the answer. ABC News did find one heck of an expert. Dr. Marc Hamilton, PhD, one of the pioneers of sitting disease research, was quoted throughout the article. We’re not calling Hamilton’s credibility into question – he’s responsible for an incredible amount of the information we use on this site; however, we would like to respond to his position on adjustable height and treadmill desks. Hamilton, and ABC News, stated that there wasn’t enough reliable scientific evidence to support the effectiveness of these workstations. – One of the most convincing articles we’ve seen on the benefits of walking desks was this landmark 2007 study from James Levine and Jennifer Miller. Levine and Miller found that using a treadmill desk at low speeds (1.1mph) burned far more calories than equivalent time at a desk. They went on to conclude that, if properly used, treadmill desks could be an effective weight-loss solution. 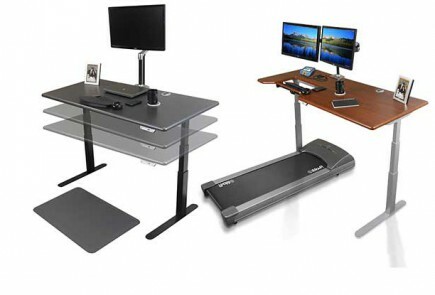 – A recent German study found that use of an active workstation could increase activity levels and heart rate for sedentary workers. – A one-year prospective study found that treadmill desks increased workplace activity levels, reduced sedentary time, and encouraged mild weight loss, all without negatively impacting workplace performance levels. – A 2012 study found that using standing workstations resulted in a considerable increase in calorie burn rate. – An evaluation of the implementation of sit-stand desks in an Australian workplace found that not only did standing desks reduce sedentary time, they also had a high rate of usability and acceptability in an office setting. – An extremely recent study by the BBC and a team of researchers from the University of Chester found that standing burns considerably more calories than sitting, and also reduces post-meal blood sugar levels. There will always be room for doubt, but we believe that, at least as of now, scientific evidence strongly suggests that standing and walking desks bring a long list of benefits to sedentary workers. And if you’re still not convinced, you may only have to wait for researchers to catch up with the soaring popularity of these workstations.